I thoroughly enjoyed illustrator Frank Deitz’s recent reminiscences of Abbott and Costello Meet Frankenstein and its influence on him. He’s spot on when he writes that the movie is a “portal allowing young people to be introduced to the classic monsters in a gentler, acceptable manner.” This reminded me of a similar friendly gateway, a book I haven’t thought about in years, How to Care for Your Monster. 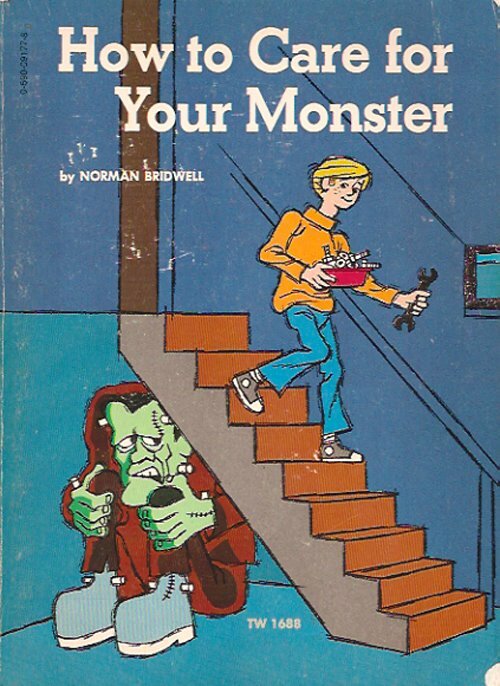 I discovered Norman Bridwell’s 1970 monster manual at a second grade Scholastic book fair circa 1976, and it instantly became a favorite. By all accounts, I was an avid reader, but only this title, a few dinosaur and shark books, and a short biography of Milton Hershey really stand out. (To this day, the memory of the caramels and heavy cream in that last one still make my mouth water.) It’s interesting to note that Bridwell is also the creator of the popular Clifford the Big Red Dog series, which was first published in 1962. The art styles are definitely the same, but these books, like most children’s books, never did much for me. Whereas, How to Care for Your Monster possessed me like a Gypsy curse. I read and reread the book and was humorously indoctrinated into a world of mummies, vampires, mad doctors, lycanthropes, and other things that go bump in the night. 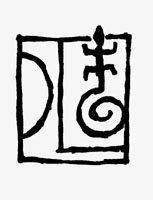 When Bridwell wrote that some used monsters might be damaged because they have been “thrown over cliffs or burned a little in old windmills by angry owners or hard-to-please villagers”, I unwittingly received a crash course in Universal Horror 101. This book should bear the subtitle A Primer for the Second Generation of Monster Kids. 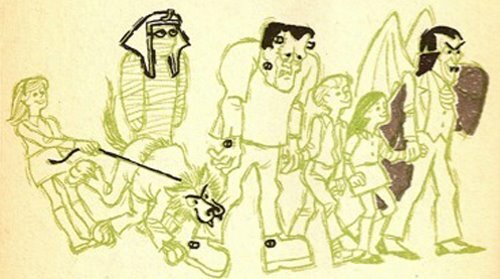 And though it mentions castles, labs, pyramids, and swamps, the pages are populated with smiling suburban kids wearing turtlenecks and Chuck Taylors and playing with their big monster buddies in TV rooms, backyards, and basements. It was the perfect synthesis of lore and reality for a six-year-old mind, and it charged my imagination. In that half-mad way that children can believe whatever they want, I took much of the book seriously. I knew which local park would yield a werewolf and was pretty darn sure the plants near Scout Field were wolfsbane. The thought of the overgrown area near the underpass filled me with adventurous zeal because I knew it was the secret entrance to a used monster shop. Dull reality gradually infected me, and I eventually realized that the other side of those bushes was just a bus stop. Looking at HTCFYM now brings me back to a time when anything I couldn’t see could be whatever I imagined. For the record, the jury is still out as to whether or not that park has werewolves. Of course, what I really connected with was the art. I loved those friendly line drawings. These were my “gentle portals” to an appreciation of the classic monsters long before I saw any of the original films. I copied them onto loose-leaf sheets and drew my own monster scenes. Those simple but certain lines defined what the pantheon should look like. I still think a werewolf must have a lupine muzzle, walk on two legs, and wear some soiled remnants of its human garb—something between The Wolf Man and The Howling; oddly, The Boy Who Cried Werewolf is pretty darn close. These drawings also prepared me for the humor of Mad Magazine and the caricatures of Mort Drucker, my next great obsession, which would begin around 1978. What really makes HTCFYM special is that it gets the first half of that monster kid classification right: the monsters. They are charming, but always maintain a hint of malevolent dignity. It’s funny and slightly comforting to see the image of the Frankenstein monster cowering under the basement stairs. It tells children that they can master their fear, but it’s also true to the hulking man-child nature of the character; it hints at the pathos that makes the monster so timeless and especially appealing to children. And though he has his timid moments, he also has those moments we weird kids love to shudder at—without being too scary. Likewise, consider the image of the family of blood donors at the dinner table with their vampire: it’s funny, maybe even sweet, but with a whiff of the macabre. This is what the Clifford series lacked—teeth! Maybe they’re only baby fangs, but there’s an edge here. 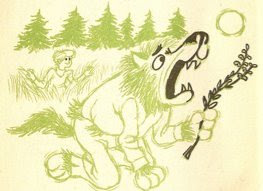 Consider the picture of the werewolf returning from a nighttime romp. It suggests a big, friendly dog eager to play fetch, but there is something uncertain about it. That beast has the glower of a pet about to turn on its master. And that bone is awfully big...about the size of a human femur, no? And that image of the guy escaping the werewolf attack is played for laughs, but I was always sure he didn’t make it over the fence. Monsters kids are young, and we don’t want to be too scared, but we can also tell when our monsters are lame. As I remember, the follow-up books Monster Holidays and Monster Jokes and Riddles definitely neutered the creatures with a few too many yucks. HTCFYM always strikes the perfect balance. I’m a children’s book editor today, and my first creation was a now-out-of-print activity book called The Official Monster Hunter’s Guide. Its lineage is obvious, and I tried to instill in it the same sense of ghoulish glee that Norman Bridwell gave his primer. It’s still one of the most satisfying accomplishments of my career, and it’s a testament to the fact that seemingly silly and simple influences can cast a long shadow, especially for us weird kids. I still love monsters, and I still love chocolate. Geof Smith is a full-time children’s book editor and a freelance writer. An avid fan of curious movies, and oddity in general, he recently started www.connoissewer.com to celebrate past fascinations and detail his search for new ones. I loved that book as a kid. I still have my original, well-read copy on the shelf. One of my favorite books from childhood. Made me wish I could get my own Frankenstein Monster-- the one seen in this book is so cool, yet so easy to befriend. like above, i had this book as a kid. i remembered the cover image but could never remember the title. when we moved from philadelphia to nj, it was one of the few things that got left behind, and i actually used to keep it under the stairs in our basement!! wow. thanks for the memories--they're all rushing back now! Don't wanna sound like a broken record here in the commnets but I still have my copy of this fab book too! Just read it to my son the other night in fact before beddy bye. Timeless fun. I think I had this book too. I certainly read it. I'd forgotten about it until I saw these illustrations again. I definitely had this book as a kid! Hadn't thought about it in 20 years. Gosh, I wish I had kept it. I've always had these vague memories of a cool monster book I once had that inspired my drawing at the time. THIS WAS IT! What a wonderful rush it was to see them when I visited today! I actually yelled out loud..."THAT'S THE BOOK!". i too, had this book when i was a kid, and i had the joke book too. but over the years they disappeared, and i found a copy of the joke book at a yard sale and bought it. i showed my kids and they didn't 'get' it! Thank you for sharing this. I've never seen this book before, but it really tapped into my love of horror icons as a kid. For me, I found a similar introduction to the genre from Scooby Doo! Well...I just experienced an amazing jump back in time. I checked this book out of the library time and time again...never grew tired of it, and really wanted a Mummy as a friend/pet. LOVE the book and the memories. Loved this book as a kid! So many great memories. Always wished there was a Monster shop in my town. I just re-purchased this gem off of amazon.com. It even smells the same way I remember. 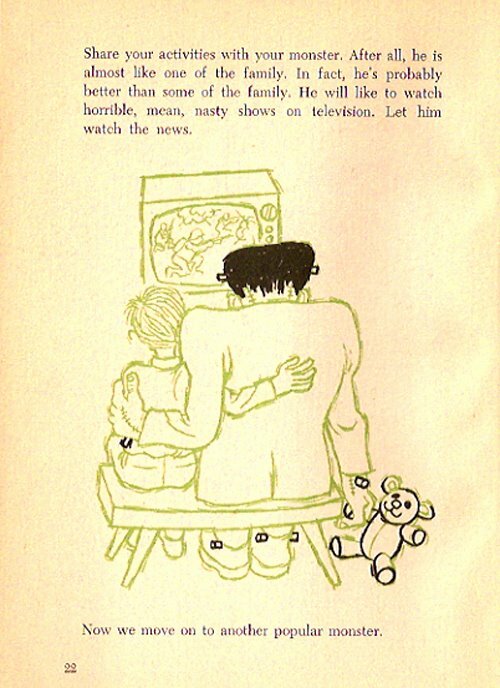 My Uncle used to read it to me when I was very small and sing the monster mash. I thin that started it all. I am now a monster aficionado and have my own horror themed radio show. This book was just as you said the perfect balance between fun and subtle horror. I wish I could meet Mr Bridwell to have it signed. After all I do have a signed copy of Where the Wild things Are! I loved this book as a kid! I would pour over the book for hours admiring it's artwork. Today, I am a freelance illustrator, and this book was an in no small way an influence on me. THANK YOU THANK YOU THANK YOU for posting this, I read this a million times and lost my copy. Just seeing these images again makes me so happy.